In the first of the series we discussed how data is the new ‘Gold Rush’ and why the regulator and project-based business analyst are two of the stakeholders with an interest in data lineage. In this edition we will be exploring two more roles. Again, any examples are usually related to a financial institution but are synonymous with all sectors. The Chief Data Officer (CDO) and Chief Data Office are fairly new additions to businesses and yet are very pertinent to an organisation. Over the years, these roles/functions have developed and become more significant due to the sheer volume of data being produced and the realisation that data is a business’s most valuable asset. Additionally, the increase of data has led to the growing regulatory demands on how to manage data in the correct and proper manor, and this responsibility often falls onto the CDO. The establishment of a new C suite role highlights the importance of organisational data. In order to utilise the power of data it must be understood, trusted, easily accessible and be of a sufficient quality. These requirements are driving the demand for data lineage, metadata management and data governance. 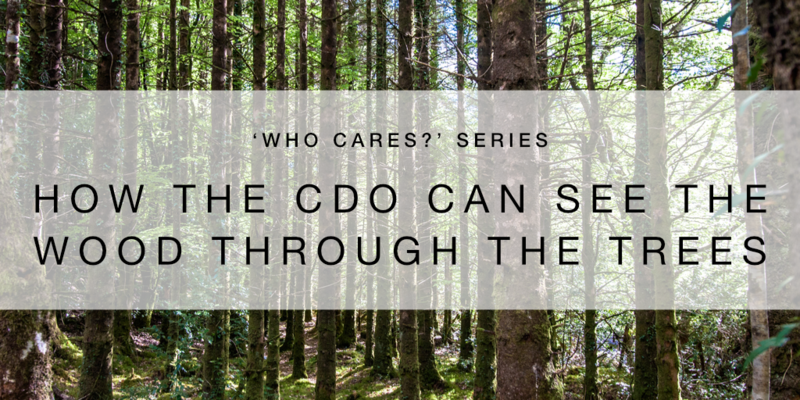 It is the role of the CDO to enforce consistency, completeness and control at an organisational level and in order to do this successfully, quality data with clear lineage is required. Taking in to consideration the large landscape the CDO has to manage, keeping control and on top of data as legally required is no easy feat. Data lineage provides a simple and elegant solution to help the CDO see the wood through the trees and gain knowledge and understanding of their organisational data, in turn helping to drive business decisions more confidently. Having a clear understanding of what data exists, where it’s held, who owns it, how is it being used, and its quality is hugely important to enable organisational insight, manage change and improve productivity. Let’s take the example of a developer that gets a business request to create a report. In an organisation with no data lineage it’s likely that the developer is not aware or easily able to check if a similar or identical report exists. They could spend hours manually scanning code and still be unable to find what they were looking for. This lack of understanding of the system and its data flows means that the developer will create a completely new report, which will require development, testing, sign off, release, support and on-going maintenance. The duplication and redundancy of code on an institutional scale costs organisation vast amounts of time and resources, as well as making organisations less able to be dynamic and agile. With up-to-date, well defined attribute level lineage for a system, a developer can immediately determine if new development is required, or if existing code can be modified and reused or, even better, if the required code already exists. By maintaining only the minimal required code-base the development process remains agile, efficient and cost effective. With the ever-increasing amount of IT system and software within a financial organisation, the drive for operational efficiency must be at the for front of priorities if IT spend is to be controlled. Of equal importance is to ensure that organisational change such as the implementation of a new regulation, system install, or upgrade should not thread lock other change within the organisation. As you can see, whether focusing on an organisation at a macro level or at the micro level having a well-defined, well documented data lineage is imperative to success. In the agile plug and play future only the data mature will survive. Up next in the series, we look at the Risk, Finance and Compliance functions.